It has been a while since I have posted anything. A lot, a lot, has changed in the past couple months. I got engaged, was a nomad for a month with no real home base, moved even farther across the county to New York state, got a new job, and all the while tried to keep training for an Ironman. It was a lot to balance, and unfortunately at Ironman Lake Placid, reality came crashing down on me and my inner most self was exposed. The bike course I hadn’t adequately prepared for, tore out my heart, ate it up, spit it out and stomped all over it for good measure. It was completely my own fault and no one else’s. I have come to terms with what happened and it has fueled my fire for the final stretch of the 2016 season. There is definitely some unfinished business at Lake Placid that I will need to go back for some day. Since Placid, I have stubbornly stuck my head down, doubled down, and thrown myself into training in a way I haven’t before. There is a hunger there to prove to everyone else and especially to myself that I can do this. Honestly, in the past, it was always easier to say that if things went wrong, or if I had a bad race, to make the excuse that I hadn’t done everything to prepare. Now, the risk is greater. I am doing all my work outs and actually doing them the way they are designed to be executed. Part of me is terrified by this. If I do fail, there aren’t any more excuses. Time to do the work. Olympic Distance National Championships was stop one of the Tour de Redemption of Barbiepants. One of the funny things about the National Championships is that I have never tapered for this race. It has never been my “A” race. I have always been training for something else. This race was no exception. But I was still hoping to land a top 18 spot and earn a coveted ticket to the World Championships in Rotterdam, Netherlands! Omaha, Nebraska wasn’t my idea of a travel destination, but the community really did embrace us. They were so kind and welcoming. Plus, the food was actually quite good! But the best part of the trip was spending more time with my Coeur teammates! I got to spend some quality time with Megan Marks, Jenn Garnard and Jenelle Glover. Also, got to see Christine Grant killing it out on the course and Katie Jones was the best (and most colorful) cheerleader out there! Thank you ladies for sharing this experience with me. The more time I spend with this incredible group of women, the more proud I am to be part of this team. You are all such beautiful people inside and out. I consider myself lucky to be one of you! My Coeur teammie Jenelle and I after finishing! Race morning came. I had packed up everything the night before, laid out my tri kit and plugged in my Garmin so it would be fully charged for race day. However, when I went to get my Garmin, it turned out it hadn’t been plugged in all the way! I had breakfast, then my mom and I went downstairs to catch an Uber over to the race start. No problem, I’ll just charge my Garmin on the way over with the car charger. So we picked up another triathlete and were on the way. Traffic was pretty backed up but we arrived with about 45 minutes to go before transition closed at 7:25. We started walking away from the car, then I suddenly realized: I left my Garmin in the car!!!!!!!!! I panicked and tried to run after the car but it was too late. There is an option with Uber to call the driver if you leave anything in there, so I did that. We finally connected but had to figure out a way for him to get back in time without hitting all the traffic. At 7:15, we finally found each other and I was reunited with my Garmin! Success! But transition was closing in 10 minutes. Oh, no! I hightailed it over to transition and was trying to throw everything together. Then, they made an announcement that since traffic had been so bad, they were going to keep transition open until 7:40. Phew. My life was saved! So I more calmly and deliberately started putting my things together in transition. It was then that I discovered that I had also left my running shoes back at the hotel. Face palm. Luckily, I was wearing an older pair of running shoes that I had been planning to do a warm up run in. Coincidence? Maybe. Miracle? Yes. Hoping and praying that this was the last of things to go wrong for the day, I went back out of transition to find my mom. Even though transition had closed, my wave was going to start until about 9:30 am. This is one of the things I dislike about the National Championships. It does ensure that the roads are more clear and less congested during the race, but the waiting game sure does stink. My wave finally came. The plan was to get out with the front pack and be aggressive. Well, it was above and beyond that. I went out fast and had established a good position. There was another group forming to my left so I started making my way over to them. Then, some girl physically pushed me under water and swam over me. I pulled her back and it took me a while to get back to where I was before. 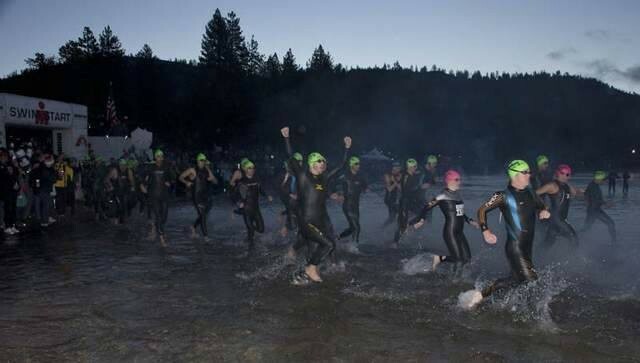 I stayed with a pack of 3-4 girls for almost the rest of the swim. I definitely thought I was in the front pack for sure. Then we started hitting the wave of men in front of us. I got kicked in the face. Ouch. Then I got kicked in the face again. It seems like I never really have a swim anymore where I DON’T get kicked in the face. There is something to be said about that, but another time. The end was in sight and it felt like forever before I was exiting the water with my little group. Turned out I was 8th out of the water. I did stay with the front pack but there had been some other fast people who had gotten out ahead of us and away. Onto the bike. The plan here was also to be aggressive and ride about 90-95% of my FTP. My little legs were not completely ready for this. They were like, dude, we’ve been training for an Ironman, what are you trying to do with me? I tried to reason with them as we hit a climb, and then another, and then another. It was much hillier than I thought it was going to be. Finally at the turnaround, my legs finally decided to cooperate and it was go time. There was a guy stranded right around there. I hadn’t seen any support on the course. So I pulled a Chrissie Wellington and threw him my flat kit hoping it would help. I really hope that guy was able to get back on the course and finish his race! My worst fear is getting a flat tire during a race. On the way back there was a dude that refused to let me pass him. No matter how many times I tried, he would keep pulling away. So frustrating! Glad that I didn’t receive any penalties as I have heard others have. But really? Dude if I am passing you on the bike, just let me. Put your ego aside. Before I knew it, we were back in transition. My mom screamed to me 14th. I was in the money! Back in transition another girl by me had racked her bike in my area. I pushed it to the side, threw D on there, grabbed all I needed and headed out. Prepared to start chicking people and taking names. But again, this is the National Championships. 3 girls passed me out of transition and I passed 2 who had been in front of me. I kept a mental count and just tried to pass every girl in sight, even if she wasn’t in my age group. It was pretty hot and the aid stations were not prepared for this many people. I took water and ice where I could and went on. The coolest part of this course was the turnaround was on a baseball field where they play the College World Series. We got to run around the bases. Apparently we were also on the jumbo-tron, but I failed to notice this. I was in the zone. On the way back, I passed some more people, people passed me, and I repassed them. I thought I was still in top 18 but was close to the cusp of not making it. I dug down and started running harder. My mom screamed to me in the finish chute. I made it! Mission accomplished! After the age up, I came in 13th place! Next year, I would like to target a top 10 place. Maybe one day I will actually get to focus on the shorter stuff and see what I really can do. But not too shabby 2 weeks post Lake Placid debacle and training for another Ironman in the coming months! I’ll take it. Lots of people to thank for this accomplishment. My mom for coming out to Omaha, having more cowbell than anyone out there and having the most distinct voice that I can always pick out in a crowd. Thanks, mom! Love you! Matt-for taking care of me every single day. This guy does all the intangibles that I can’t do for myself. I am used to doing everything myself which leaves me stressed out and I don’t get to accomplish everything. But Matt has slowly showed me that it’s ok to ask for help. And I love him for that. Craig, my coach-he comes up with some pretty crazy ideas of what I can do and makes them a reality. I don’t feel like we have reached my full potential yet and I am so excited to see what happens in the coming months. Coeur-This company is hands down the greatest. Not only do they make amazing clothes, but they care about their customers in a very refreshing way. There are always notes from them in packages and the founder Kebby cheers all of us on. Not to mention that all my teammates are incredible women. Love you all! Base Performance-Every time I do one of these races in hot conditions, Base Performance saves my life. Matt Miller is one of the hardest working and funniest people out there. Thanks for all you do guys! TYR-My SwimSkin was on point for this race. Thanks to Bryan Barge and everyone at TYR for your support. Also congratulations for all the swimmers who competed for Team TYR at the Olympics. Way to bring home the hardware! Shoutout to Cody Miller for getting an individual bronze in the 100 breast and a gold in the 4 x 100 Medley Relay. You rock! Normatecs and Will Smith-Normatecs are one of the best tools out there for recovery and preparation for a race. Without these guys I would not have had the performance I did at Nationals. Thank you! And to all of you reading this, if you have made it this far, THANK YOU! I couldn’t do this without all your love. Thanks for all the encouragement. My dreams are a reality because of you. NEXT UP: IRONMAN 70.3 WORLD CHAMPIONSHIPS IN MOOLOOLABA, AUSTRALIA! Congratulations on qualifying for Worlds! That’s so exciting! Let the redemption of Barbiepants continue!